How much is shipping? Orders £99+ ship free free. Orders below £99 are charged at a minumum of £3.95. How quick will my order ship? Orders placed Mon-Fri before 2pm will ship the same day. Excludes Bank Holidays. We'll make sure your orders are packed and shipped properly so that they arrive with you in perfect condition. We use Royal Mail and DPD Local to deliver your orders. Please specify in the comments section of your order if you would prefer not to receive your order by either Royal Mail or DPD Local. Please note, LiPo batteries can not be shipped by Royal Mail, so DPD Local will be used if your order contains LiPo batteries. Orders upto £98.99 require postage to be paid, starting at £3.95 for Royal Mail 48. 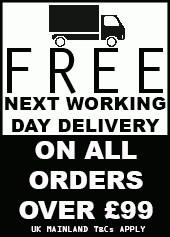 Orders of £99 and above will be shipped via DPD Local free of charge using their Next Working Day Delivery option. All orders received before 2pm are shipped the same day. We ship orders Monday to Friday (excluding Bank Holidays). Orders placed on a Friday before 2pm with a Next Day Delivery option will be delivered the following Monday unless previously arranged for Saturday delivery. Please contact us if you need to us to arrange a Saturday delivery. Orders placed after 2pm on a Friday will be shipped Monday (unless a Bank Holiday) for delivery on Tuesday. We will not ship high value orders to unconfirmed PayPal delivery addresses. If your PayPal delivery address is not confirmed, please contact us prior to ordering for other payment methods and/or advice for confirming your PayPal address. We reserve the right to cancel and refund any order placed if delivery is requested to an unconfirmed PayPal address. Orders returned by the Royal Mail as undelivered due to incomplete or incorrect addresses or non-collection of your order from your Post Office are liable to a re-delivery charge at our discretion. Delivery to Orkney Islands, Shetland Islands and other more rural parts of Scotland may take longer than stated, please be aware of this when choosing your delivery method. If in any doubt, please contact us before placing your order. All Europe & Worldwide deliveries are made via Royal Mail "Airmail" International Signed For or Tracked and Signed For service. Orders returned by the Royal Mail as undelivered due to incomplete or incorrect addreses or non-collection of your order from your Post Office are liable for a re-delivery charge at our discretion. International orders can only be paid via PayPal.